When Joel, an attorney in Bolton, MA, first researched solar energy, a PV system cost around $80,000. Many an early adopter understands this tale of woe. “With no tax breaks or SREC credits, the cost was prohibitively high,” he says. 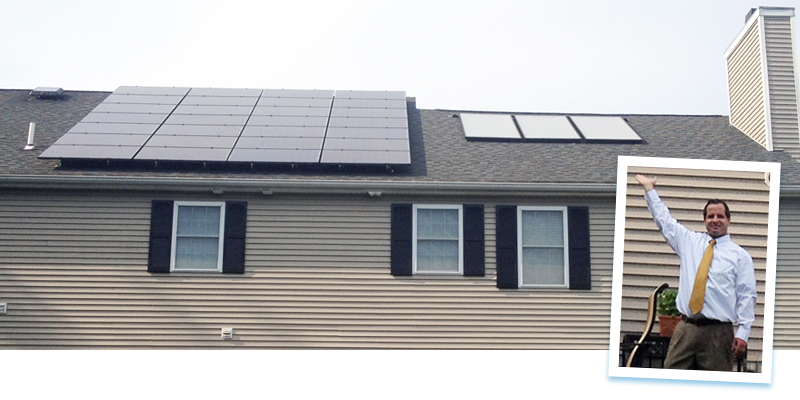 “I decided to install solar on my home to reduce my carbon footprint. I knew I had the perfect solar roof – large, with southern exposure and no shade. “I hoped to save some money over time, but never imagined it would work out so well. My electric bills dropped from $250 a month to about $100. A large part of my electric bill previously came from heating water for my three daughters’ showers, so I’m sure my solar hot water accounts for close to half my savings. “My first SRECs (Solar Renewable Energy Certificates) sold at $500, but then dropped as more solar entered the market. That was disappointing, but overall my solar savings have exceeded my expectations. And I love controlling my costs by producing my own power.